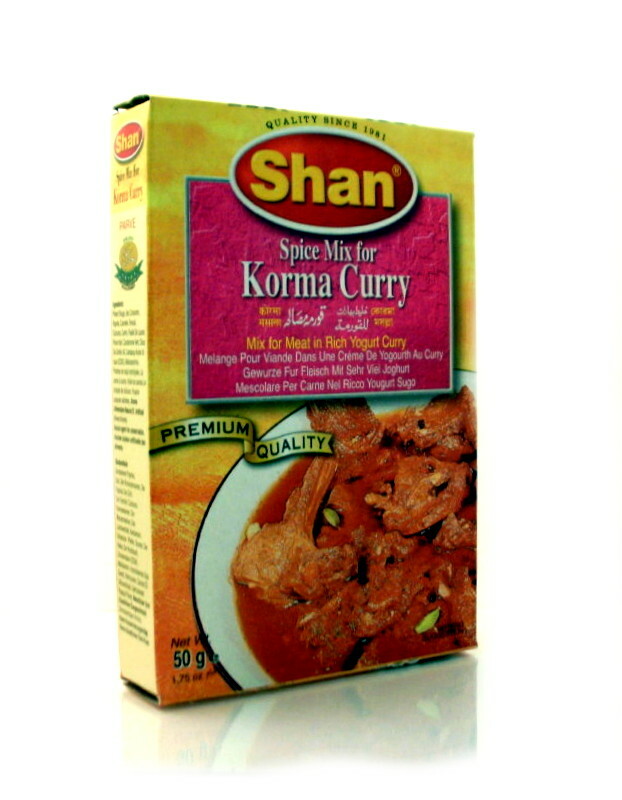 Shan Korma Curry [mix for meat in rich yoghurt curry] | Buy Online at The Asian Cookshop. Easy to cook, hard to resist! Recipe - Beef korma [mughalai meat curry] - Ingredients required: beef 1kg, onions 300g chopped, yoghurt plain 300g, garlic paste half tbsp, ginger chopped 20g, ghee 250g, kewra water 2-3 tbsp, shan korma one packet. Method: 1] in small deep pan heat ghee and add onions, fry on high heat til onions are transparent, stir frequently, 2] reduce flame to low and continue to fry until light golden, 3] remove from heat and drain onions from ghee [keep ghee aside in pan], spread the drained onions on an absorbant paper, allow it to cool and crisp , then crush coarsely with rolling pin, do not grind into a paste, 4] in same ghee add garlic and fry for few secs, now stir in meat, yoghurt, ginger, shan korma curry mix. cover and cook on low heat until meat tender - if desired add 1-2 cups water. 5] add crushed fried crisp onions and kewra water, cover and cook for 5 mins or until ghee seperates from gravy. 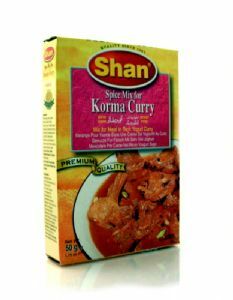 Ingredients: red chilli, salt, coriander, paprika, cinnamon, fennel, turmeric, cumin, musk melon, bay leaf, black pepper green cardamom, cloves nutmeg, garlic, papain, natural and artificial flavour screw pine.